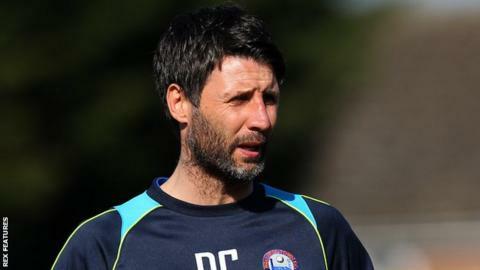 Braintree Town manager Danny Cowley is set to speak to National League rivals Lincoln City about becoming Imps boss. Chris Moyses stepped down as manager at Sincil Bank after finishing the season 13th in non-league's top tier. Full-time Lincoln made an official approach for 36-year-old Cowley, who is also a PE teacher, on Monday. But Cowley said he is "not in a position to make an intelligent decision" yet after Sunday's play-off semi-final defeat by Grimsby. He told BBC Essex: "For me, you can't make intelligent decisions without having all the information in front of you so for the plan is at some stage to speak to Lincoln. "From what I've been told there's other clubs that have been interested." Former Concord manager Cowley, whose brother Nicky is his assistant at the Iron, said it would be "very, very difficult" to leave Braintree after leading them to third in the table in his first season in charge. But, having spent his whole managerial career in part-time football, Cowley is interested by the chance of taking over at a club that was in the Football League as recently as 2011. "Nicky and I are ambitious," he said. "As a manager you want to challenge yourselves at the highest level you can and to be able to do that in full-time football would be a real challenge for us. "We've only ever worked in part-time football so for us to take our model into a full-time environment would be something we'd like to do. "I've got to say I've got a fantastic job and I know Nicky feels the same. We teach at a brilliant school, it's got fantastic pupils and it would be very, very difficult for me to leave that role."